Are you ready for the first Monthly MashUp of 2015? This year there are a few exciting changes that I’ve can’t wait to share with you. There’s a new Monthly MashUp archive page where you can check out the previous mashUps, a new Facebook Group where we can share mashUps and ask questions, the new format will have posts running for five days in a row instead of being spread throughout the month, and the most fun news is that I’ll be introducing some amazing guest posters as a part of the Monthly MashUp! So let’s get started with January’s MashUp. My inaugural guest poster is my older sister who blogs here and can be found on Instagram as @frenchymms. While she mainly blogs about the humor she finds in the everyday craziness that is her life, she teaches, crafts, gardens, rides horses, and has about a billion other interests, but most importantly she sews. Recently she has found a love for sewing with knits and so when she agreed to be a part of the Monthly MashUp I knew exactly which patterns we should mash. You all know my love for everything Kitschy Coo, right? The fabrics, the patterns, her wit, her adorable new puppy…but let’s focus on her patterns for now. I knew as soon as I introduced my sister to Kitschy Coo patterns she would fall in love with them. 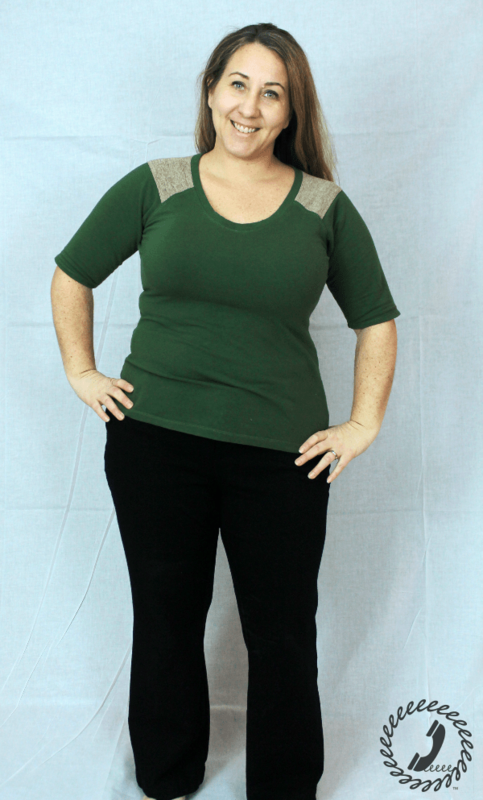 The fit is always great and with all the knit fabric tips available it’s the perfect place to start sewing with knits. So after several humorous texts back and forth about high bust size she began her knit fabric journey. After a few months of watching my sister make Lady Skater and Comino Cap remixes and MashUps, I thought the Penny Pinafore and Trifecta Top would be the perfect MashUp for us to tackle in January. The Trifecta Top is one of my favorite tops to make. It’s a raglan tee with options for short, 3/4, or long sleeves, shoulder insets, three different necklines, and an optional banded waist. I’ve made several of them for myself in the past year and I still haven’t exhausted the options. Kitschy Coo has 8 sizes which run from high bust size 30″to 44″ and high waist from 24″ to 38″. 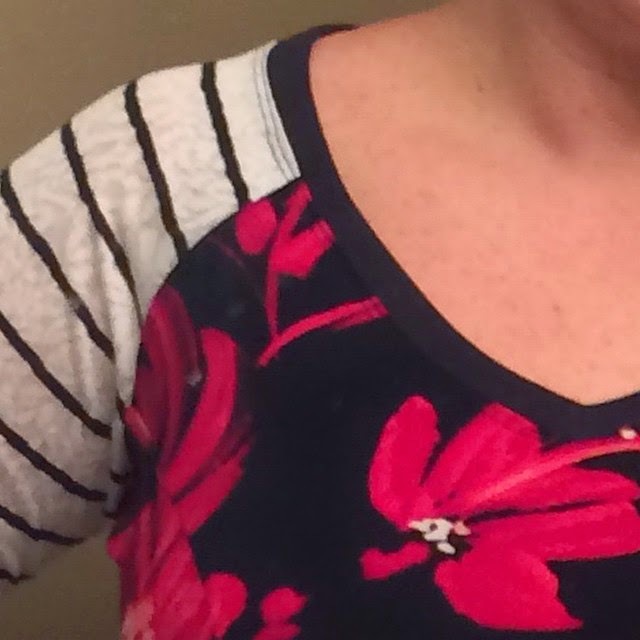 For this long sleeved one I used the v-neck option with shoulder insets. The navy fabric is this really soft laguna cotton jersey (*affiliate link) from Imagine Gnats. I’ve been pleasantly surprised with the weight and wear of this jersey. I just took this above pic over the weekend and I’ve worn this top an embarrassing number of times since I made it back in December. It’s been washed over and over and probably has tomato sauce on the front of it if you zoom in closer since I had been wearing it to cook supper just before taking these pics, hehe. The fabric has held up incredibly well and in fact I just purchased a bunch more for more spring tees so I highly recommend this fabric if you’re looking for a solid standard tee-weight fabric. 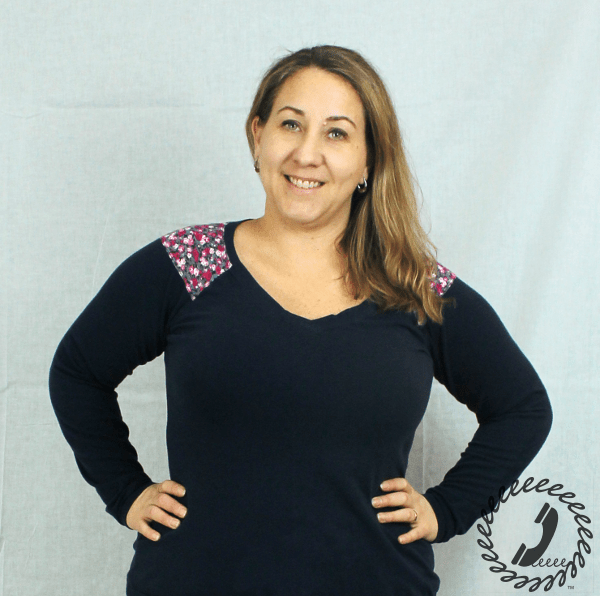 This top is made with a bamboo french terry from l’oiseau. It’s a little thicker than a jersey and super warm and cozy. I had a gift certificate to l’oiseau which I had won so I splurged a little on this fabric and I am completely in love with it. I only wish I had enough of it to make the long sleeves vs the 3/4, but at least I get the chance to show you what the 3/4 sleeve looks like. Again, I used the v-neck and inset shoulder options. It’s hard to tell in this pic, but the insets are a sweater knit from Jo-Ann that has gold polka dots on it. The Penny Pinafore makes a great top, but also comes with dress lengths. I decided to make myself a fun dress with this black/greyish with silver stripes fabric I found in the red tag bin at Jo-Ann. The princess seams give a flattering shape and a really fun chance for color-blocking. You may remember the MashUp I made last February for Bean. I used the Mini Penny girl’s sized dress to make one of Bean’s most worn dresses and the color-blocking really stands out. I decided to use all of the same fabric instead of color-blocking the dress, mainly because I got a great deal on this fabric and had a lot of it available. Kitschy Coo recommends this pattern as intermediate level, but the matching marks on the princess seams make it easy to get through. Just take your time on the princess seam matching and you’ll be fine. So are you ready to mash these two patterns? Join the new Facebook group and start sharing! I’ll show you the rest of mine tomorrow and we’ll go through how to alter the patterns and sew them later this week. My sister will post her mashUp on Thursday and I’ll be sure to send you the link to check it out. In the meantime, let’s get the giveaway and link-up going! Don’t forget you can add any mashUp you’ve made in the past 60 days AND you can use your instagram pics so you don’t need a blog to link up anymore. 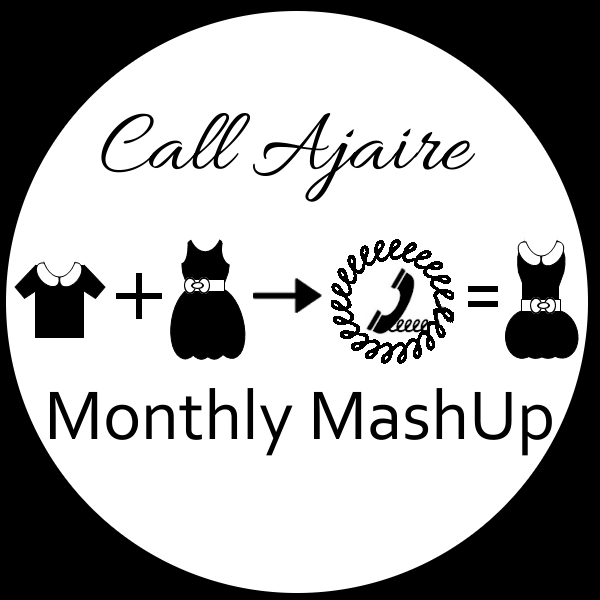 The link-up will be open through the end of January so you have time to create this month’s MashUp if you’d like. I’ll feature some favorites from the link-up next month. Patterns I already own and don't have to buy!! Just kidding…sort of! I love the Penny!!!! I'm not sure about the Trifecta because of the raglan sleeves, but that's my issue, not the pattern. Now I have one of each and one mashed up. I can't wait to reveal on Thursday!! And kitschycoo's puppy is really what it's all about!! !